To configure the settings of your network drive and to manage your files via web interface, login to your device using a web browser (e.g. IE, Firefox, Safari, Chrome). The best way to login to your device is by going through the MyAkitio web portal at http://www.myakitio.com. Under most circumstances, this automatically redirects you to your device, no matter if you are at home or somewhere on the road. The web portal at http://www.myakitio.com can be accessed from anywhere, no matter if you are at home or not. It will automatically redirect you to your device at home and open the login page. Your default home server name is the MAC address of your network drive. You can find this number on a sticker either on the retail packaging or the device itself. Login to your account. The default user name and password for the administrator is admin. For security reasons, we strongly recommend changing the password after the first login. You can always use the MAC address to locate your device but you can also register your own device name and choose something that is a bit easier to remember. For more details, see Preferences > Portal Server. 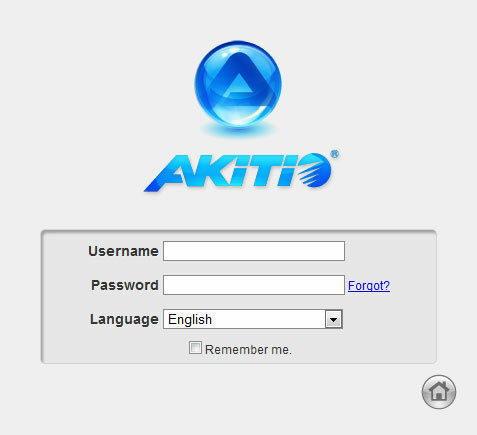 If you are unable to login through the MyAkitio web portal, try to open the login page on your home network (LAN) first. For more details, see Login > Local Login. If you get the error Device Offline, make sure that your device is connected to the internet and the power is turned on. The system LED should be a solid color and it should not be flashing. To further troubleshoot this error, check that your network router allows incoming traffic to your network drive. See Portal Server and Network Setup for more information about how to setup remote access and also see our FAQ about the error Device Offline. If you are unable to login through the MyAkitio web portal, enter the IP address of the network drive directly into the URL field of your web browser to open the login page without going through the web portal. Lookup the IP address of your network drive in the DHCP log. Copy the local IP address (e.g. 192.168.1.10) and paste it into the URL field of your web browser. This opens the login page without going through the web portal. For Mac users, you can also enter ISHARING.local instead of the IP address, whereas “ISHARING” is the host name of your device, into the URL field of your web browser to access the login page. If you are unable to login through the MyAkitio web portal and you don't know how to find out the IP address of your network drive, you can download and install the finder utility. This will allow you to scan for the network drive on your home network (LAN) and connect to the login page. Download the finder utility for Windows at http://wiki.myakitio.com/isharing_finder_pc.zip. Make sure that the network drive is connected to the same local network as your computer and that the power is turned on. If you have only just turned on the power, wait for about 60 seconds until the OS LED stops flashing and the system is ready. Double-click on the iSharingFinder.exe file to start the finder utility. It will automatically scan your network and list all the network drives it recognizes. If it does not find your device, click Rescan to run the search again and make sure the program is not being blocked by a firewall. You can now either copy the IP address of your device and enter it into the URL field of your web browser or select the device from the list and click Connect to open the login page. Download the finder utility for Mac OS X at http://wiki.myakitio.com/isharing_finder_mac.zip.